Not easy to install and definitely taking two people but beautiful. I replaced a chrome glass door with this one and wow what a difference. 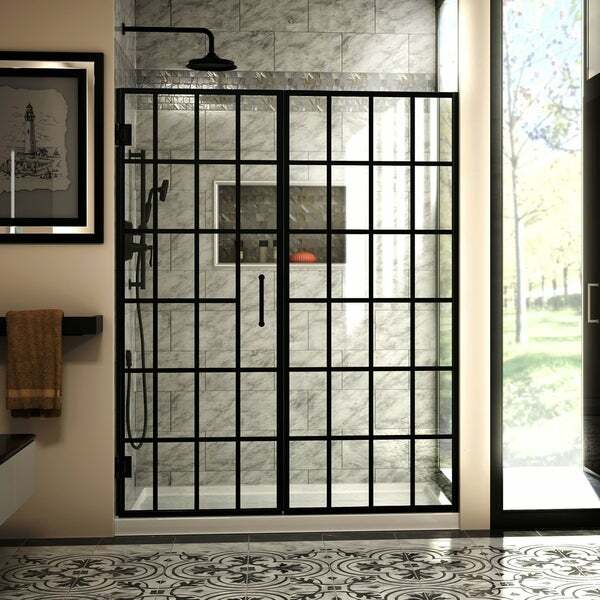 The DreamLine Unidoor Toulon is a frameless swing shower door designed in step with modern market trends. The Toulon has a stylish window pane look, with a satin black finish that is bold and striking in any bathroom. The glass pattern is made using an application of JetGlaze durable paint, offering a unique style without the metal framing for easy maintenance. DreamLine exclusive ClearMax water repellant and stain resistant glass coating adds superior protection from stains and is nearly maintenance-free. With clean lines, modern accents and an upscale look, the Unidoor Toulon adds timeless style to any bathroom space. Model Size: 58-58 1/2 in. W x 72 in. H; Walk-in Opening: 27 in. Dimensions 1.0 In. X 58.5 In. X 72.0 In. Such a beautiful shower door! A must have for any bathroom! These door look so great!! We absolutely love the black finish and look it gave to our new master bath!! They are beautiful and functional and an amazing price!! The shipping was quick and delivery was easy!! Beautiful classy doors. Sturdy and solid. Had professional installation without any issues. I would definitely purchase again without hesitation. Absolutely stunning. Everyone compliments them. The glass is very thick, not flimsy. Installed a few months ago, holding up great. Shower doors are beautiful. Heavy. Many compliments. My contractor said it wasn’t the easiest install. Took him most of the day to install by himself. I’m a little worried about the stationary door and how secure the door is. You def don’t want to lean on it or fall against it. It’s not that secure. Love! Love! Love!!! Looks awesome! 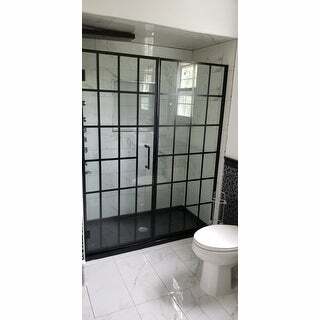 "Can the movable shower door panel be pushed in to get into the shower as well as being pulled out to get into shower? I may have a problem w my toilet being in the way. So wanted to make sure you could push the door into the shower to get In it. Is the movable shower door 27”? Is this the measurement from the wall or do you add anything because if the hinges? Thank you." The shower doors now feature adjustable hinges, allowing you to choose if you would like the door to open inward or outward. The hinges come to you pre-set by the factory to open outward, which is the recommended position. Should you choose to adjust the hinge to open inward, you will need to change the orientation of the vinyl piece that the door closes against, installing the flange on the outside of the shower. Instructions will be included with the hinge for changing the orientation of the swing. A simple adjustment is all that it takes to allow the door to open inward. The door is 28 inches and that includes the hinge, your access width is 27 inches. "Does it come with the door opening on right side and hinges on left?" This is completely reversible for right or left wall door installation. "Can I order just two of the doors without the handle? (similar to the right door)"
"Can I order only the door? 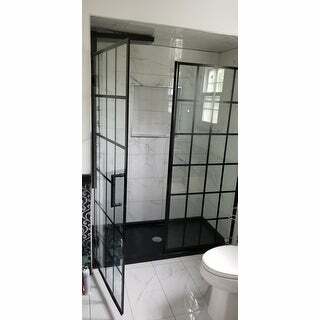 my shower area is very small and the panel that comes with would not fit in..."
Unfortunately, the Unidoor Toulon is not available as a single panel door at this time. "I need it to be a sliding door but exactly like this one with or with out the frame in black." Unfortunately, we do not have the Toulon design in a sliding door at this time. "Can this be used with a all tile shower or does it need a shower pan? Thanks"
I used mine with a shower pan but, the door can be placed wherever you would like and have a sweep at the bottom to hold back water. My shower enclosure is tile and I made sure to use a tile bit and silicon when drilling into the tile when putting the doors up.